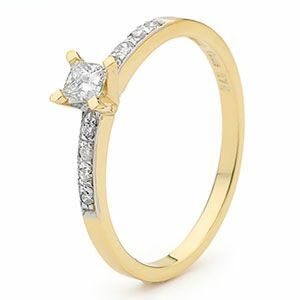 Stunning 9 carat gold Diamond ring with a brilliant 0.18 carat carat centre stone and 8 pave set shoulder stones making the total Diamond weight 0.25 carat. Gemstone: 1 x Diamond J colour P1 clarity 0.18 carat. Gemstone: 8 x Diamond J colour P1 clarity 0.01 carat. Material: 1.5 x Grams solid 9ct yellow gold.